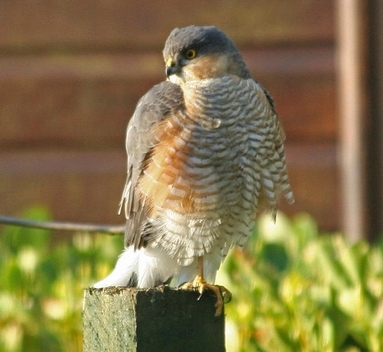 Sparrowhawks killing birds in gardens, Great Spotted Woodpeckers taking chicks from nest boxes or crows raiding nests, while all part of life’s rich tapestry, have lead to debate about the impact of predators on songbirds. Recently, research on this by Newson S.E, et al was published in the Journal of Applied Ecology 47: 244-252. This involved collaboration between the British Trust for Ornithology, the University of St Andrews, the Game and Wildfowl Conservation Trust and funding from Songbird Survival. Forty years worth of data from the Breeding Bird Survey and Common Birds Census was statistically examined. The researchers were looking for a relationship between the number of the predators and the number of prey. Three juvenile and adult bird predators including Sparrowhawk and five nest predators including Great Spotted Woodpecker along with twenty nine potential prey species were all considered. This is arguably the most sophisticated, long–term and large scale analysis of its kind. The debate will no doubt go on, nationally and here on Arran.